Apps on a Theme: Paige’s Page! ← Did you see the preliminary findings from the Young Children, New Media & Libraries survey? One of the hardest early literacy skills for me to add into storytime is writing. Holding a crayon, coloring, painting—all these activities help children develop the fine motor skills they will need to pick up a pencil in kindergarten and begin writing, and it’s necessary to model this for parents. But I confess that I rarely think to add writing skills into the storytime mix. So, since we’re on a storytime break, I went looking for something to remedy this deficiency. Success! I discovered a fun app that helps with these fine motor skills, and I’m looking forward to including it in our play time after stories. It’s called Dipdap by Cube Interactive and is available for iPad ($2.99), Android ($1.99), and Kindle Fire ($1.99). Dipdap is a little critter who interacts with a child’s animated drawings. There are 16 adventures available for play. A child can choose to play the adventure without interacting, or chose to interact by drawing. Dipdap wordlessly presents a scenario to the child, like trying to reach the stars. Little Dipdap jumps and jumps with all his might to try and reach the stars. Then, the dashed outline of a rocket is presented. The child traces the rocket outline (the outline can be turned off if desired), and can chose colors or any other add-ins he would like to draw. 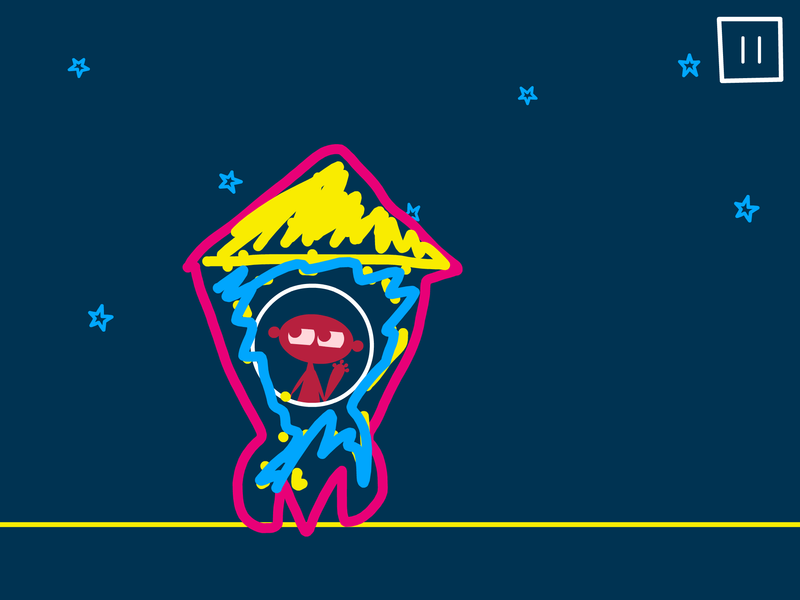 Then, Dipdap climbs into the drawn rocket and shoots off into space, bouncing off of stars as he goes. It’s pretty heady stuff for a cartoon character to jump into something you’ve drawn! There is also a drawing sketchpad in which the child can draw anything they would like. Dipdap sits at the bottom of the page and watches the drawing, actively moving his eyes to whatever part of the screen is being touched. He doesn’t interact with the drawing in any way besides watching it, but the drawing can be “photographed” and saved to the pictures section of the tablet. There are no in-app purchases, and there are parental controls that allow you to change the music, sounds, and guides. I think that it will work well to give each child who wants the opportunity a chance to play one of the adventures. They only last a brief time and I’ll be able to move on to the next child who wants a chance. I love it when a storytime plan comes together! Awnali Mills works in the Children’s Dept. of a public library and she gets the snot scared out of her by sudden loud sounds coming out of apps she’s trying out. She blogs at The Librarian is on the Loose. Little eLit is a collaborative think tank of professionals thinking about the topic of young children, new media, and libraries. Individuals who share their viewpoints, experiences, and presentations in Little eLit blog posts are expressing their personal views and do not represent Little eLit as a whole. I'm a youth services librarian with a penchant for exciting ideas and engaging programs. It's a sure bet that if you talk to me about STEAM, whimsy, and trying new things, we'll be best friends forever. Posted on December 1, 2014, in Apps and tagged Awnali Mills. Bookmark the permalink. 2 Comments. Little eLit started in 2011 as a record of librarian Cen Campbell’s experiments in using new media as a tool to promote early literacy in library programs and services. In 2013, Little eLit morphed into a crowd-sourced, grass-roots professional learning network to develop promising practices for the incorporation of new media into library collections, services and programs for families with young children. The majority of these practices were recounted and documented on the Little eLit blog, a portion of this site that is still available but no longer updated. Today, Little eLit continues to exist in the form of a collaborative, web-based think tank. The Little eLit Think Tank is a community forum where you can share what you’re working on, ask questions, and talk to other librarians, storytellers and early childhood educators who are also working with young children & new media. Little eLit- The Trailer from carissaabc on Vimeo.